Brian T. Gallagher joined the law firm of Council, Baradel, Kosmerl & Nolan, PA in August of 2011. Prior to joining Council Baradel, Mr. Gallagher served five years in the United States Air Force as a Judge Advocate General (JAG). Mr. Gallagher's stateside duty assignments allowed him to gain valuable trial experience defending the Air Force against federal lawsuits, as well as prosecuting cases involving drug conspiracies, assault and various other felonies and misdemeanors. While deployed to Iraq, Mr. Gallagher was responsible for the management of the detainee review process at Camp Cropper, Iraq. 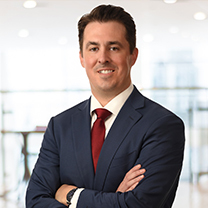 Mr. Gallagher is admitted to practice in Maryland, Washington, DC and their respective Federal District and Bankruptcy courts. Mr. Gallagher was also granted the honor of being sworn into the bar of the United States Supreme Court on November 4, 2014.